This butternut squash soup recipe is my mom’s creation. I reckon she’s one of the best cooks around, so you can be sure that this soup is absolutely delicious. It couldn’t be easier to make and cooks in no time at all. 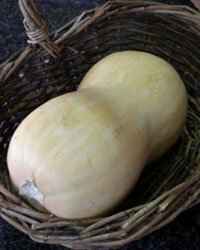 Butternut squash is incredibly healthy and boasts high levels of beta-carotene which has powerful antioxidant and anti-inflammatory properties – helping reduce the severity of asthma and arthritis. It can also help reduce the risk of colon cancer. Butternut squash also contains potassium – helpful in lowering blood pressure, vitamin C – also with powerful antioxidant and anti-inflammatory properties, folic acid (folate) – preventing certain birth defects if taken by pregnant woman as well as lowering homocysteine levels therefore reducing the risk of heart attack and stroke and fiber which reduces the risk of colon cancer and essential to good health. Here is the delicous recipe - a real winter delight! 1. Put all the ingredients into a large pot and cook until soft – about 45 minutes. 2. Once the soup is cooked, liquidize until smooth. 3. Add salt and pepper to taste. 4. Serve with love and crusty whole-wheat or rye bread and enjoy!